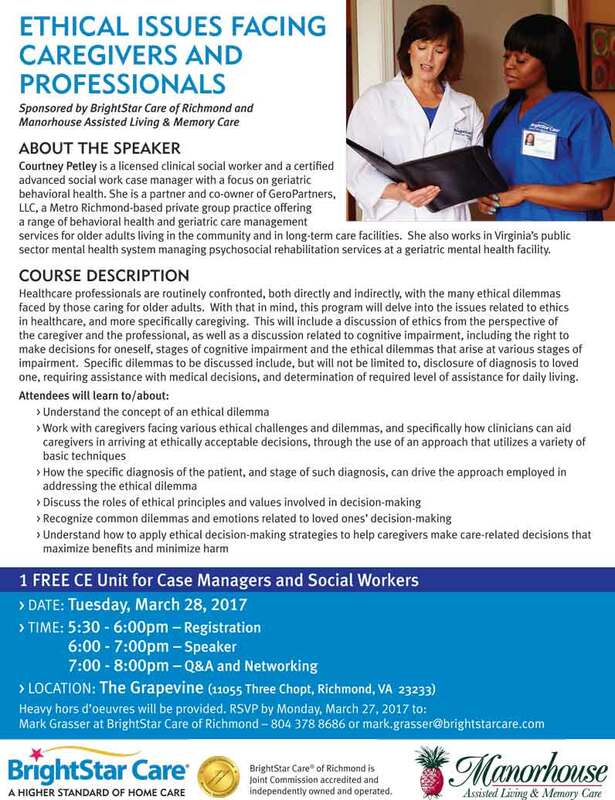 CE Event: Ethical Issues Facing Caregivers and Professionals in Richmond, VA | BrightStar Care " "
Courtney Petley is a licensed clinical social worker and a certified advanced social work case manager with a focus on geriatric behavioral health. She is a partner and co-owner of GeroPartners, LLC, a Metro Richmond-based private group practice offering a range of behavioral health and geriatric care management services for older adults living in the community and in long-term care facilities. She also works in Virginia’s public sector mental health system managing psychosocial rehabilitation services at a geriatric mental health facility. Healthcare professionals are routinely confronted, both directly and indirectly, with the many ethical dilemmas faced by those caring for older adults. With that in mind, this program will delve into the issues related to ethics in healthcare, and more specifically caregiving. This will include a discussion of ethics from the perspective of the caregiver and the professional, as well as a discussion related to cognitive impairment, including the right to make decisions for oneself, stages of cognitive impairment and the ethical dilemmas that arise at various stages of impairment. Specific dilemmas to be discussed include, but will not be limited to, disclosure of diagnosis to loved one, requiring assistance with medical decisions, and determination of required level of assistance for daily living. BrightStar Care of Richmond proudly provides Home Care and Support for Seniors, including 24 hour in home care, and support in independent and assisted living communities. We provide all levels of home care from companion services to Skilled Nursing. Medical Staffing, Home care, In-Home Skilled Nursing, In-Home Physical Therapy for pediatric, adult and geriatric patients, Companion and Personal Care for Elders with Alzheimer’s or Dementia. We also provide Home Child Care, Sitter and Nanny services for Children and Support for New Mothers. We Support Veterans as a partner of the VA/Veterans administration provider network and are a Home Care Provider for U.S. Department of Labor, Division of Energy Employees and Occupational Illness Compensation. We Accept most Long Term Care Insurance benefits, provide Hospice care, Live-in care, CNA, Caregiver, RN, LPN, RN Supervision, Compassionate Care, and Compatibility Guarantees. We are an ALS Society partner, Alzheimer Association member, and provide care for developmentally disabled and individuals of all ages with mental health and behavioral health diagnosis. Other services include safe discharge and transportation from the hospital or rehab facility, Post Op care both short and long term, Pre-Operation and preparation help and assistance, and client monitoring for out of town family members. Proudly serving Richmond, Henrico, Hanover, Chesterfield, and Goochland, including West End, Midlothian, Oilville, Montpelier, State Farm, Rockville, Manakin Sabot, Maidens, Glen Allen, Powhatan, Ashland, Crozier, Chester, Colonial Heights and Petersburg in Virginia.